A new report published in the Transparency Market Research (TMR) demonstrate intense competition among the players operating in this market. The manufactures are largely focused on the companies who is investing more money on labor and the capacity to produce more product in less duration likely to upsurge growth of this market in near future. According to TMR, the large number of operators are operating in the global market for IT robotic automation market, thanks to the regional and global presence of the players operating in this market. The research report also includes some of the key players operating in this market such as Infosys Limited, Capgemini, Blue Prism, Automation Anywhere, Inc. and Tata Consultancy Services Limited. 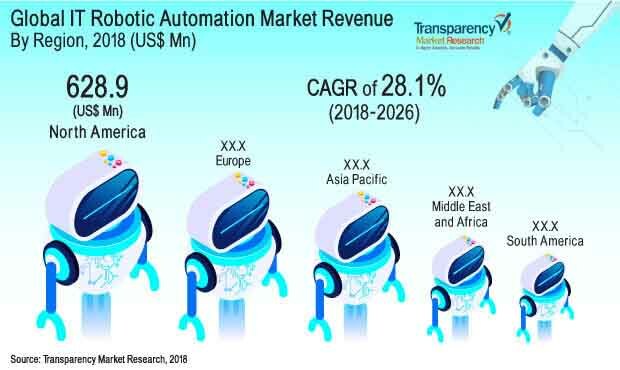 The revenue generated by the global market for IT robotic automation market stood at US$ 11,417.4 Mn during the course of forecast period from 2018 to 2026. The global market for IT robotic automation market likely to expand at high double digit 28.1% CAGR throughout the forecast period. Based on tool, the model based application segment likely to dominate the global market for IT robotic automation owing to its large scale adoption. On the basis of geography, North America expected to remain the dominating region in terms of adoption and high demand for the IT robotic automation market. Closely followed by the Asia Pacific owing to high demand for the robotic application in automation industries. The demand for the IT Robotic automation increases due to improved production capacity of company without hampering the production quality, this factor is one of the important factor fueling demand for the global IT robotic automation market. The reduce cost of production and increased production capacity is a major drawback propelling demand for the IT robotics automation market in next coming years. The rising popularity of the robotic automation in IT industry for improvement in function especially in financial and accounting, this can be another factor influencing growth of the global market for IT robotic automation market in coming years. The IT robotic application has witness massive growth for the application in the IT industries such as infrastructure management, application management and business process outsourcing (BPO) management are some of the benefits provided for the growth of this market. Furthermore, growing implementation in the cloud based solutions are the key factor positively influencing growth of this market in coming years.Increasing complexity in the IT operation and management supporting growth of the global IT robotic automation market. On the other hand, all these factor influencing growth of this market expected to increase the rising need for security concern in the technology sector, this can be another factor negatively impacting growth of this market in near future. Furthermore, presence of outsourcing contacts in the BPO industry is another factor restraining the growth of this market due to major complexities include long contract period. However, reduction in operational cost and time save are one of the important factor by responding to the customer need is another factor providing opportunities for the key players to strengthen their presence across the globe. Nevertheless, rising prevalence of advance and modern business concept and increasing consumer satisfaction by providing quality products are one of the other crucial factor positively driving growth of this market.